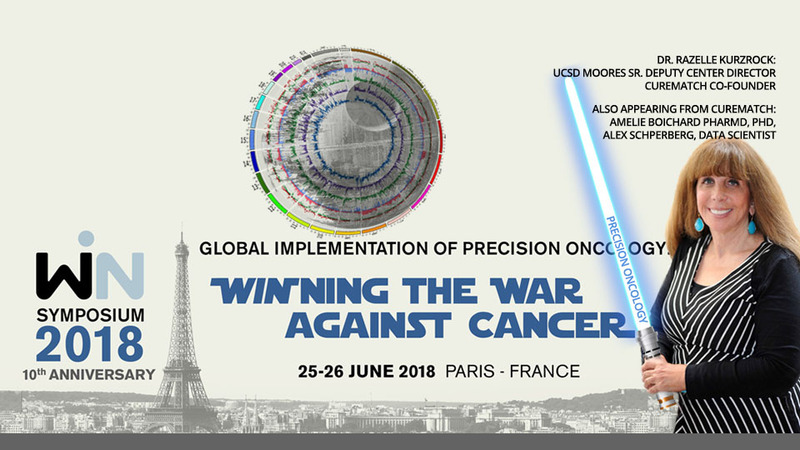 SAN DIEGO, CA – June 22, 2018 – CureMatch, Inc. offers results of an artificial intelligence (AI) based cancer study at the WIN Symposium 2018 in Paris, June 25-26. CureMatch Co-founder Razelle Kurzrock, M.D. is the Organizing Committee Co-Chair of this 10th anniversary Worldwide Innovative Networking in Personalized Cancer Research event. 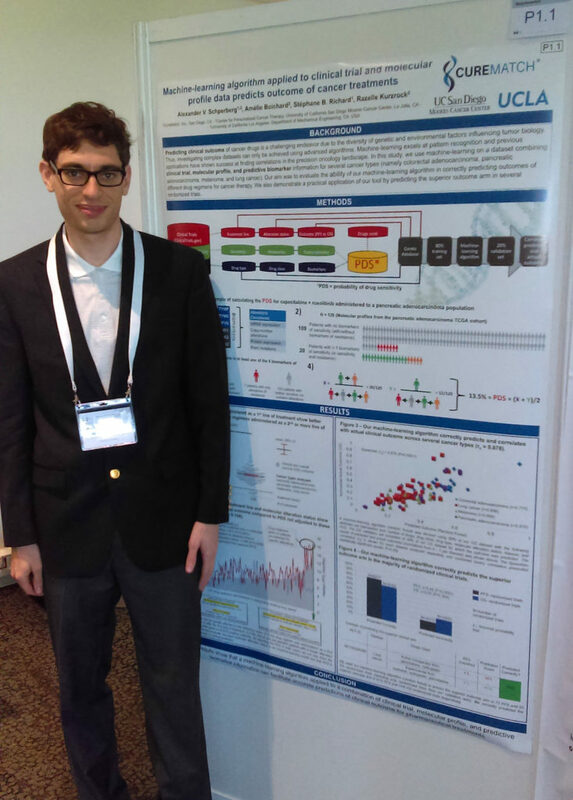 CureMatch data scientist, Alexander V. Schperberg, will present the cancer research poster titled, “Machine-learning algorithm applied to clinical trial and molecular profile data predicts outcome of cancer treatments” which he authored along with Amélie Boichard, Pharm.D., Ph.D., Stephane B. Richard, Ph.D., and Razelle Kurzrock, M.D. This AI study offers a statistical model for the probability of drug sensitivity using a combination of clinical trial, molecular profile and drug-biomarker information. The results indicate that a machine-learning algorithm can facilitate the accurate prediction of clinical outcomes for pharmaceutical treatments, a typically challenging endeavor due to the diversity of genetic and environmental factors that lead to large and complex datasets. Advanced algorithms to investigate these datasets offers the practical application of predicting better outcomes of clinical trials based, in part, on the molecular description of each tumor type. Razelle Kurzrock, M.D. also heads the Clinical Trials Committee for the WIN consortium and will be a keynote lecturer at this year’s WIN Symposium sharing results of the global WINTHER cancer trial, which she co-lead. Dr. Kurzrock is a featured panelist and speaker throughout the two day event presenting new data showcasing advances in precision oncology including announcing the first targeted tri-therapy combination trial (SPRING_01). Dr. Kurzrock cofounded CureMatch to offer therapeutic cancer decision-support to oncologists around the world. The PreciGENE® disruptive technology is the result of a sponsored collaboration between CureMatch Inc., UC San Diego and the San Diego Super-Computer Center and offers predictions that correlate with exceptional responses to cancer treatment. The CureMatch platform has been optimized utilizing over 750 molecular profiles clinically reviewed during weekly pluri-disciplinary meetings (tumor boards) at the UCSD Center for Personalized Cancer Therapy, and is currently engaged in several validation programs in addition to already being commercially available. [UPDATE] Pictured below is CureMatch Data Scientist, Alex Schperberg in Paris. The WIN Symposium poster presentation research shows that by using Machine Learning, the CureMatch algorithms are able to precisely predict which arm of a randomized trial would show longer progression free survival and overall survival. This is a tool which could be adopted by oncological pharmaceutical agents to optimize future clinical trials or studies. Background: Predicting clinical outcome for cancer therapies is difficult due to the diversity of cancer histologies and the complex biological network of genetic and environmental factors. Machine-learning algorithms excel at pattern recognition and have shown success at identifying correlations in the precision oncology landscape. In this study, we trained our machine-learning algorithm on a dataset incorporating clinical trial and molecular profile information in order to predict outcomes of different drug regimens for cancer therapy. Materials and methods: We retrieved 395 clinical trials from ClinicalTrials.gov and 939 molecular profiles from the Cancer Genome Atlas with advanced (stages III-IV) colorectal adenocarcinoma, melanoma, pancreatic adenocarcinoma or lung cancer (adenocarcinoma or squamous cell carcinoma). For each intervention arm, a dataset with the following attributes was curated: line of treatment, number of drugs, pharmacology class, disease, mutation status of the population, probability of drug sensitivity (percentage reflecting the status of genomic, transcriptomic, and proteomic biomarkers in the population of interest), and outcome. The nonparametric Spearman correlation (rs) was used to correlate predicted and actual outcome. Predicting the best treatment arm in randomized trials was evaluated by a z-score using the binomial probability test. Results: A total of 544 progression-free survival (PFS) and 451 overall survival (OS) data points were used as training sets to build a random-forest decision model, providing correlation coefficients of 0.82 and 0.70 respectively. A total of 165 PFS and 113 OS data points were used as validation sets. For both PFS and OS validation sets, the Spearman correlation (rs) between predicted and actual outcome was statistically significant (PFS: rs=0.879, OS: rs =0.878, P<0.0001). The better outcome arm was predicted in 81% (PFS: 62/77) (z=5.24, P<0.0001) and 71% (OS: 37/52) (z=2.91, P=0.004) of randomized trials. Conclusions: Derived from clinical and biologic data points, our machine-learning algorithm was able to predict the better outcome arm in the majority of randomized trials. Our model may be exploitable as a tool to optimize clinical trial design with pharmaceutical agents. http://winsymposium.org/ Abstracts from the WIN Symposium may be found in the ABSTRACT BOOK.